What’s the formula for a happy life? Neil Pasricha is a Harvard MBA, a Walmart executive, a New York Times–bestselling author, and a husband and dad. After selling more than a million copies of his Book of Awesome series, he now shifts his focus from observation to application. 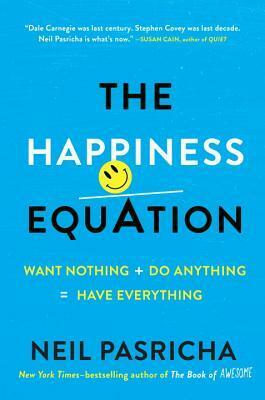 In The Happiness Equation, Pasricha illustrates how to want nothing, do anything, and have everything. If that sounds like a contradiction, you simply haven’t unlocked the 9 Secrets to Happiness. Each secret takes a common ideal, flips it on its head, and casts it in a completely new light. Pasricha then goes a step further by providing step-by-step guidelines and hand-drawn scribbles that illustrate exactly how to apply each secret to live a happier life today. The Happiness Equation is a book that will change how you think about everything—your time, your career, your relationships, your family, and, ultimately, of course, your happiness. I kinda love this book. HARD. I’ve read it twice, have things highlighted, took notes and quite often will just grab it off my shelve and flip open to a page and read. It’s that kind of self-help book. Now, don’t go rolling your eyes at the term “self-help”. And really, I guess that’s not the right term. Self-improvement would be better. This book approaches happiness in a concrete way with doable things rather than “just think happy thoughts”. I really like the way that Pasrischa broke things down in digestible bits. It made it easier to absorb the information and just pick the book up and start reading from anywhere. The writing style is very engaging and not once did I feel myself skimming or skipping over any parts. I also found myself smiling and nodding a lot while reading and even reading some parts out loud to my husband. Anyone searching for ways to me happier with life (and really, who isn’t?) should definitely give this book a read.